A voiceover often adds impact to a film. A classic example is Amitabh Bachchan's thundering baritone at the beginning of Lagaan, which served as a prologue and gave an idea of what to expect from the film. Prakash Jha too is planning to adapt a similar strategy for his political thriller Satyagraha. 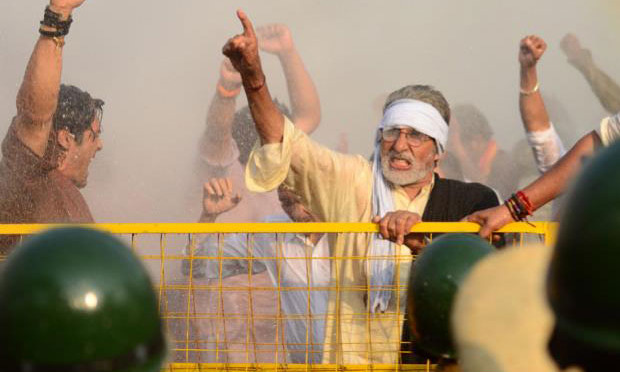 "Satyagraha as a concept is based on Mahatma Gandhi and Prakashji is planning to start the film with a quote from Mahatma Gandhi's autobiography My Experiments With Truth", said a source close to the film, adding that nothing has been finalised yet as they are still toying with the idea. If reports are to believed and if Jha zeroes in on the idea, he may either request Amitabh Bachchan, who plays the lead role in the film and whose character is apparently inspired by social activist Anna Hazare, to give the voiceover for the quote or he may just flash it on the screen. Satyagraha also stars Ajay Devgn, Kareena Kapoor, Arjun Rampal, Manoj Bajpayee and Amrita Rao, and releases 23 August 2013.